Since I have been posting about software quite a bit lately, I thought I’d back up and talk about something just as important: your physical environment. You want to strike a balance between having things clean and uncluttered, and having things close by when you need them. It’s a tough line: how can you have it so that things are out of your way but not so inconvenient that it becomes a hassle to get something done? A few months ago I totally re-did my home office and for me at least, I have come up with a decent solution and hopefully some of you might find it useful. My home office is in the basement and is affectionately known as “the dungeon” because it is cold and there is not a huge amount of natural light. There is a TV in it (as you will see), but we don’t use it much as we don’t have cable (yes we are one of those freak families). I have a Mac Mini hooked up to the TV running Plex that we use as a media center. Sometimes during the day I will have music playing on it, or when there is a webcast (or a hockey game) I want to watch, I will put it on the TV and work from the sofa. Before I go through my new office, I have a confession to make. Are you familiar with the old saying “the cobbler’s children have no shoes?”. Well, that was pretty much the situation for the first year of DocumentSnap. I had gone through and eliminated my entire filing cabinet of non-critical paper, but my workspace itself was pretty much a disaster. Longtime readers might remember that I started going paperless because I moved and I was annoyed at having to move my filing cabinet that was bursting at the seams with paper. I swore I would never do that again, so I bought a ScanSnap and the rest is history. Is that a gong show or what? There’s a big inbox with paper all over the place, cords everywhere, a scanner and an all-in-one fighting for space, and the desk is being held up by boxes. What a nightmare. I knew I had to do something, so I decided to start completely from scratch. I downloaded a room planner from Ikea, got out my tape measure, and went to work. All that is on there is my computer, monitor, phone, and some drink coasters. Occasionally I will have a notebook and some note paper but that is it. I try to be disciplined about keeping stuff off the desk. Here is a wide shot of the workspace. Can you guess what my favorite movie is? Hmm, I wonder what is inside that cabinet. You can see there is a number of sections. I have a tray for holding miscellaneous computer stuff, my ScanSnap S1300, my all-in-one, and some hanging file folders. The hanging folders are important. Any paper that comes into my office that needs to be dealt with goes in there. There is an “inbox” folder, a “WIP” folder for things I am working on, a “To Scan” folder, and a “To Pay” folder. That’s it. You might notice that there is no filing cabinet near my desk. This is completely intentional. I do have one, but it is hidden in the closet. It is extremely, extremely rare that any paper gets filed into there, and there is none at all in the bottom two drawers. 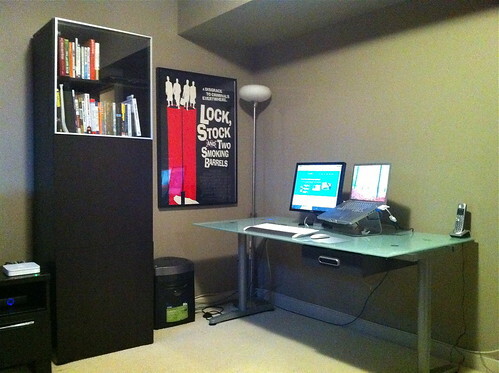 I have some more pictures of the home office that you can see in this Flickr workspace set. So far I am loving the change, but there are still some things to do. For starters, as I mentioned, the light isn’t the greatest. I think I need to improve that. Also, its a bit boring. I need some art or something on the walls, especially above my desk. If anyone has suggestions for cool things to put there, leave a comment. I hope this gives you some ideas. I certainly drew a lot of inspiration from workspaces that I found online. If you have any suggestions for improvements or have other cool workspaces, feel free to drop a comment and let us all know. I just got one and really love it, and only $38. That’s a really nice lamp! I have to admit I don’t REALLY need one anymore, but now I’m tempted. ($60 in Canada though – darn). That looks great…. 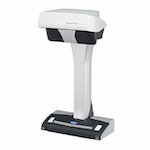 You have given me some ideas… thank you… recently purchased a s1300i scanner, and love it…. now to clean up my office mess…. 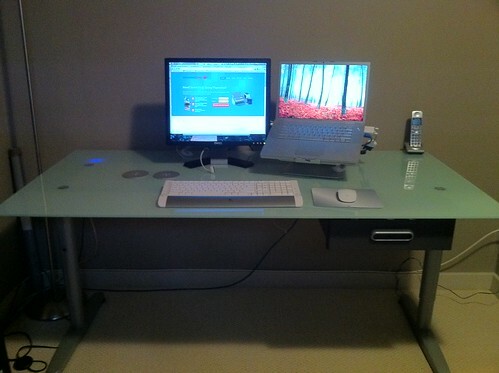 Thanks again Brooks for all your ideas…..
Ahhh, Brooks, even a techno dork like me can feel comfortable at your site! This room is so soothing. I can't wait to show you what my office looks like and to telepathically give you the vision of where it wants to be. The color! I love the color! My husband and I have receently changed who pays the bills (for 24 years me, now him) and he is much less frightened to go paperless. I think one day my life will be clean. 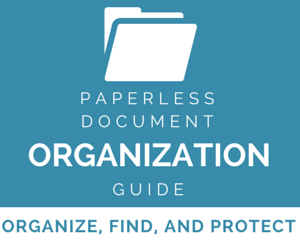 Paperless office solutions are not intended to alter business workflow. 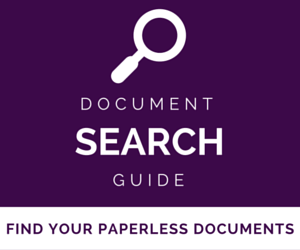 In fact, good paperless solutions are supposed to change your office workflow as little as possible. 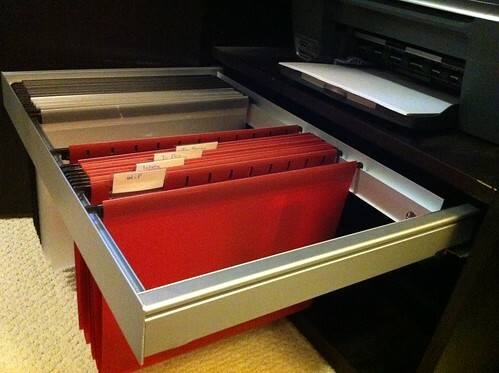 In most cases, you just have to direct new files to the scanner instead of the filing cabinet. And once a week, have an employee take the backup discs home with them. Slick workspace. Where did you get the torchlight and are you happy with it? Hi, I believe my wife picked it up at Ikea years and years ago. I'm more or less happy with it other than the fact that we broke it (so it doesn't stand up straight) and light in general in that room isn't the greatest still. Indeed, I did not notice any change in my working style or the limited use of paper in the office. Well, at least not until reflecting back after doing the readings. I noticed a sharp increase my usage of paper since becoming a student. Even though many readings are provided as PDFs, my fellow students and I tend to print them out as hardcopies. There are just too many affordances that paper provides that current technology doesn't provide. I love my scan snap but am unsure of the software to organize files. Is devonthink complicated? 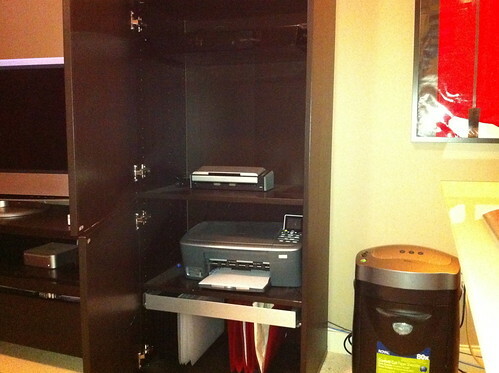 Good job on putting the printers to the closets and clearing everything from the desk! I’m actually thinking about a laptop stand like yours. Wow Michael your office looks great. I love what you did with the cables and routers etc. That's awesome. I hear the Griffin Elevator is popular too. We just moved, and I left behind a room full of Ikea's Journalist shelving – too much for the much smaller room, and an invitation to clutter. My vision for the new office has been surprisingly close to what you've got here, which is a great help! I'll look into the BESTA. Thanks! No worries, I had a lot of inspiration from looking through Flickr, LifeHacker, and Unclutterer, so hopefully this will help someone too. I really like that tall cabinet and how it is open up top. What is it? It's from Ikea's BESTA line. 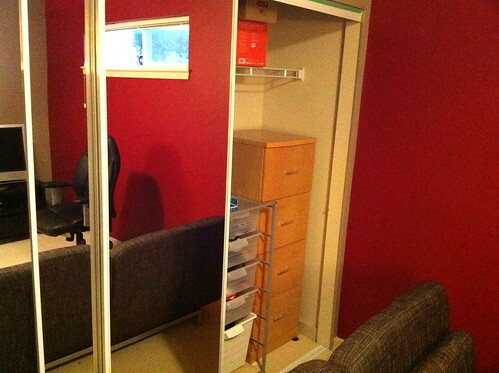 Here's a link to the line: http://www.ikea.com/us/en/catalog/categories/depa…. You basically choose the frame then choose the doors, so I did 2 closed ones on the bottom and a glass one on the top. You can do a ton of mixing and matching though. Hi, looks nice and clean. 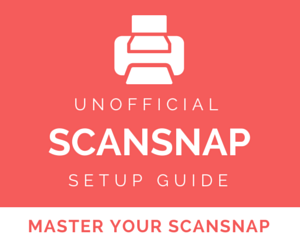 i recently bought a scansnap 1300 but i can't get it to work in os x. It keeps saying "ocr error" when i scan something. Did you run into this problem? Hey Mark, I do use OS X to scan using a S1300 and I've never run into that. If you'd like, take a screenshot of the error and email it to brooks at documentsnap dot com and I can see if I can see anything obvious? Maybe when you initially installed the drivers it didn't install ABBYY FineReader or something? I'll try to reinstall and see if I missed anything. If I can't figure it out i'll email some pics. Where did you get that hanging folder thing? It looks like great. Photos would be my suggestion. The new canvas wraps are pretty cool. Costco even does them. Bigger is better at least 12 x 18, or a panoramic vacation shot would be nice too. You can even get skins that you stick to the walls. The office looks great. 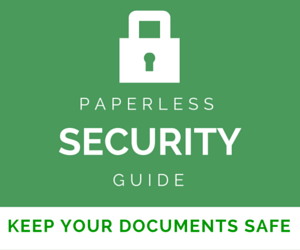 I always say we need to look paperless too. I painted the wall where 5 ugly Hon cabinets used to sit. My office is still a disaster, but all client files are scanned! Going digital was the best thing we ever did. We have scanned over 50,000 on one ScanSnap and put the replacement parts in- Works like new. I just Googled for parts mentioned in manual. There was a kit. Thanks for the photo idea. I'll check out Costco. Thanks for the suggestion and wow, you are a true ScanSnap warrior! Congrats on your office redecoration. it looks good. I too, have just gone paperless and rearranged my home-based office. I should have, but didn't take "before" photos, and the project is currently a work-in-progress, but when I'm done, I'll probably post a few shots somewhere. The reorganization started when my wife hired a feng shui consultant to come into our home and give us a top-to-bottom analysis, and it was our offices that got the most attention. 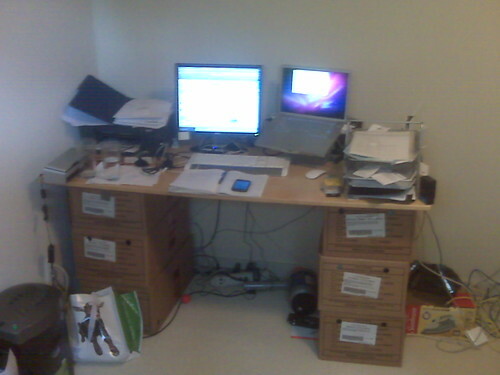 Fact is, we were doing things right in the rest of the house, but my office, in particular, was a disaster. Her recommendation was to open things up by allowing for easier flow through the room, and for artwork and wall-hangings, place things that inspire, motivate and drive me within my field of view across from the desk. She actually suggested a "vision board" ( a collage of images of my "ideal vision" for my life). That's a bit 'touchy-feely' for my sensibilities, but the underlying notion is sound. I had heard about vision boards but I am glad to hear I am not the only one to find it a bit touchy-feely :). Who knows though, maybe it's worth a shot!